Make Your Wooden Jigsaw Puzzles By Using Your Own Photo! PuzzlesPrint provides you with a perfect opportunity to make your unique jigsaw puzzle. Personalizing a wooden jigsaw puzzle is a fun thing, especially if you want to gift it to someone, either kids or someone special. You can use your unique image or text on the puzzle, make it personal! Choose a picture from the family occasion, parties, wedding or even your and your friend’s selfies to personalize the jigsaw puzzle experience. Make your wooden photo jigsaw puzzle by selecting jigsaw size and uploading a photo, design or artwork. A Remarkable Gift– Wooden Jigsaw Puzzles! The concept of customized jigsaw puzzles is a new one and is raging around quite a lot. Unlike the cardboard jigsaw puzzles, the wooden pieces are stronger, and they also give off a nice feeling when held. At PuzzlesPrint, we provide two different types of wooden jigsaw puzzles, with six different piece counts. We compile the different pieces of the wooden puzzle that perfectly fits your needs! Make a Better Message With unique wooden jigsaw puzzles! At PuzzlesPrint, you will find three different and unique wooden photo jigsaw. Each puzzle can be used to represent a certain message. The letters are part of the puzzle, and each one of the larger letters is enveloped in the regular shaped photo jigsaw. The message are, “Happy Birthday”, “Merry Christmas” and "I Love You". To make your picture puzzle experience a memorable one, you can order our wooden puzzles to create distinctive gift photos. Jigsaw Puzzles That Radiate Beauty! The making of the picture puzzle is important to us; that’s why use finest quality 4 mm plywood. 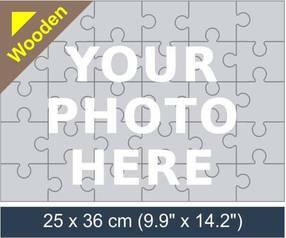 We provide your customized and personal wooden photo jigsaw in a packaged box that is manufactured beautifully, along with the photo you have selected on the lid. To order your own personalized wooden picture puzzle, all you have to do is to select the size of the puzzle, number of pieces you need, and upload the photo of your choice and make adjustments to it. Moreover, if there is any text you need, you can have that inserted as well. Once added to your shopping cart, leave the rest to us, we will provide you with quality, customized wooden jigsaw puzzle.